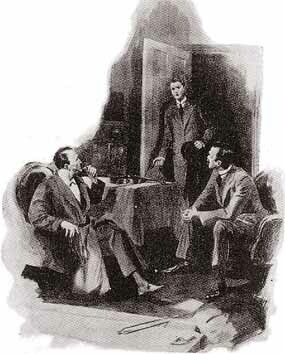 “I will do so myself,” said Holmes, “in order to show that I have the events in their due order. The professor, Watson, is a man of European reputation. His life has been academic. There has never been a breath of scandal. He is a widower with one daughter, Edith. He is, I gather, a man of very virile and positive, one might almost say combative, character. So the matter stood until a very few months ago. “We thought it rather excessive,” said our visitor. “Exactly. Excessive and a little violent and unnatural. Professor Presbury was rich, however, and there was no objection upon the part of the father. The daughter, however, had other views, and there were already several candidates for her hand, who, if they were less eligible from a worldly point of view, were at least more of an age. The girl seemed to like the professor in spite of his eccentricities. It was only age which stood in the way. “About this time a little mystery suddenly clouded the normal routine of the professor’s life. He did what he had never done before. He left home and gave no indication where he was going. He was away a fortnight and returned looking rather travel-worn. He made no allusion to where he had been, although he was usually the frankest of men. It chanced, however, that our client here, Mr. Bennett, received a letter from a fellowstudent in Prague, who said that he was glad to have seen Professor Presbury there, although he had not been able to talk to him. Only in this way did his own household learn where he had been. “And the box,” said Holmes. “Ah, yes, the box. The professor brought back a little wooden box from his travels. It was the one thing which suggested a Continental tour, for it was one of those quaint carved things which one associates with Germany. This he placed in his instrument cupboard. One day, in looking for a canula, I took up the box. To my surprise he was very angry, and reproved me in words which were quite savage for my curiosity. It was the first time such a thing had happened, and I was deeply hurt. I endeavoured to explain that it was a mere accident that I had touched the box, but all the evening I was conscious that he looked at me harshly and that the incident was rankling in his mind.” Mr. Bennett drew a little diary book from his pocket. “That was on July 2d,” said he.